The anti-establishment Five Star Movement has won key mayoral races in Italy's capital Rome and Turin, cementing its role in Italian politics. Her victory is a blow to Prime Minister Matteo Renzi's centre-left Democratic Party (PD), which won in Milan and Bologna. "It was not a vote of protest, but of pride and change, " she told supporters, promising to rebuilt trust between the people of Turin and its elected representatives. Ms Appendino's win, although more narrow than in Rome, was a significant step for Five Star because Turin is a big power base for the PD as well as the headquarters of car-maker Fiat. 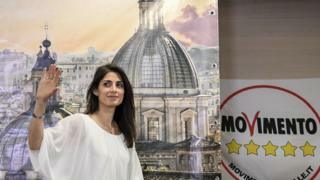 In Rome, 37-year-old lawyer Virginia Raggi promised a new era for the city as she celebrated her victory over PD candidate Roberto Giachetti. "I will be a mayor for all Romans. I will restore legality and transparency to the city's institutions after 20 years of poor governance," she said. Ms Raggi will find a city mired in debts of more than €13bn (£10bn; $15bn) - twice its annual budget. Romans are frustrated by potholes, piles of rubbish and serious deficiencies in public transport and housing, the BBC's James Reynolds reports from the Italian capital. PD's Ignazio Marino resigned as mayor of Rome in October over an expenses scandal. The city has been without a mayor since then. Five Star's rise in Rome was fuelled by a big scandal involving alleged Mafia influence at Rome city hall. In Naples, Italy's third city, left-wing former prosecutor Luigi de Magistris won a second term with two thirds of the vote. Sunday's results were bad news for Prime Minister Renzi, who has staked his political future on an October referendum in which he wants Italians to back far-reaching constitutional reforms. The plan is to end Italy's tradition of "revolving-door" governments and inject stability after years of party infighting and legislative logjams.